Brittany Phelan lived her first Olympic experience at age 22. Although she was part of the national team and went to the 2010 Vancouver Olympics, she was not part of the line-up. Sochi was definitely a dream come true! Brittany finished 15th in the Slalom discipline. Her rank in the World Cup circuit is 27. She had a solid first run and a more aggressive second run, improving her position from 17th to 15th overall. She is pretty happy with her results, but when you race you always race to win. For Brittany’s parents, who accompanied her, it was the celebration of a long journey. “I remember when Brittany was four she told me she wanted to race on the Alpine Ski World Cup circuit. She accomplished that and now she is an Olympian”, says Sherry, her mom, with tears in her eyes. Brittany’s brother and sister could not come to Sochi, but were cheering for her and really proud. Actually, her brother Micheal’s new nickname in school is “Sochi”. Brittany is on a roll. As soon as her Olympic race was over, she was already focusing on the next World Cup in Are, Sweden, March 8.We are confident her determination and discipline will pave the way to a bright career. 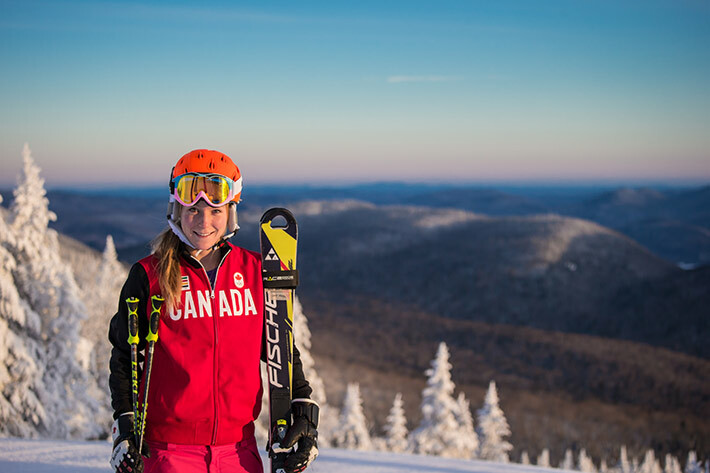 Tremblant is proud to sponsor Brittany and wishes her the best of luck for the rest of the season.